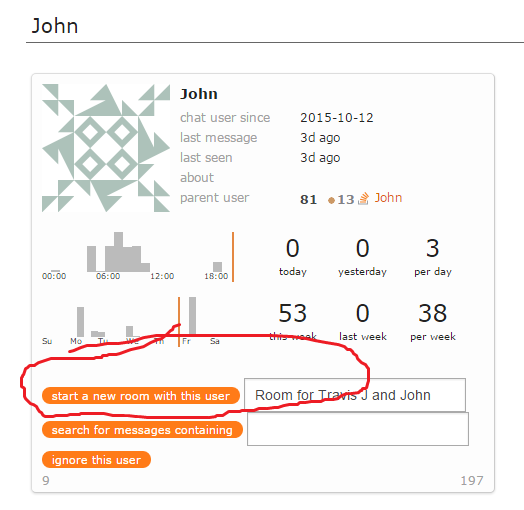 Why doesn't Stack Overflow provide a feature which can invite other users to a chat room? I know that if there are too many comments but the problem still not yet solved, we can move the discussion to chat in order to make the page clean. However, some of the discussion might not come out with a solution. Would it be better if the user can notify other users that are online to join the chat? Of course users can accept or decline the invitation. Once in the room, there is also a link to invite. Not the answer you're looking for? Browse other questions tagged discussion feature-request chat . Can room owners get back the ability to delete messages? How is the invitation combo filled (made visible) in a specific users chat profile? Should there be a chat link on the question page?